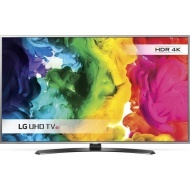 alaTest has collected and analyzed 231 reviews of LG 55UH668 Series. The average rating for this product is 4.5/5, compared to an average rating of 4.3/5 for other products in the same category for all reviews. We analyzed user and expert ratings, product age and more factors. Compared to other products in the same category the LG 55UH668 Series is awarded an overall alaScore™ of 90/100 = Excellent quality. Never a paper manual these days. Overall an excellent TV for the price. Would highly recommend it.